Talented stayer Red Rifle (5g Giant’s Causeway x May Night, by Gulch) claimed another feature win in the $250,000 Grade II Bowling Green Handicap at Saratoga on the weekend. A last start winner of the Grade III Dominion Day Stakes at Woodbine, the Todd Pletcher trained Red Rifle was ridden off the pace and surged through a gap to coast clear and win the 1 and 3/8th mile contest on turf by two and a half lengths. “Beautiful trip--perfect trip,” said winning rider Javier Castellano. “I was able to take advantage all the way inside on the rail. In a long distance, on the grass, the most important thing is to save all the ground. And that's exactly what I did. He did it very professionally today and I'm very satisfied with the way he did it." Todd Pletcher will consider a variety of options for the versatile son of champion sire Giant’s Causeway, who is effective on all surfaces. “I think he's just maturing, mentally and physically. He's really just found his groove this year,” he said. “He's now won big races on three different surfaces. He's just a throwback kind of horse, he's hardy, he's tough. He's a gelding now, we just need to look at the opportunities and place him where he fits. He won the Hawthorne Gold Cup last year, he just won a race on Polytrack at Woodbine and now on the turf. All options are on the table." 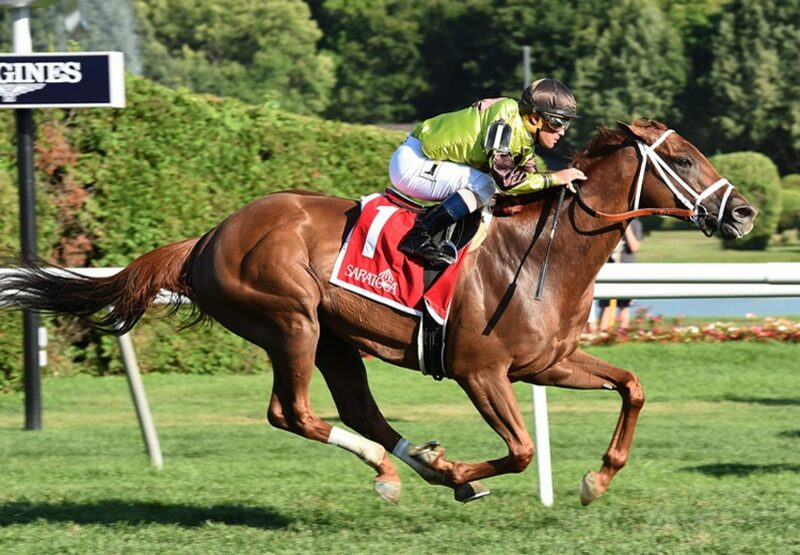 Red Rifle has now won seven races and placed six times from 19 starts earning just shy of $700,000 A $250,000 Keeneland September purchase, Red Rifle is from smart Grade II placed stakes-winner May Night.